How do I transfer my account balance and dispensing preferences onto my smart bottle or band? What happens if I lose my smart bottle or band? You can report a lost or stolen bottle by logging into your account here or through the Instream Water app. 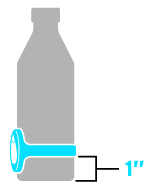 Once your bottle or band is reported lost or stolen, we will prevent that unique bottle/band from being used at any Instream Water refill station. If I lose my bottle or band, do I lose the value on my account? Once you have transferred your account balance onto your bottle or band, it lives there. If you lose the bottle or band, you will lose the value stored on it. Where are the Instream Water refill stations located? We are launching the concept in Colorado in the fall of 2018. Click here to see where the Instream refill stations are located. If you would like to request an Instream Water refill station in your community, click here. NFC is a form of short-range wireless communication between devices. NFC uses magnetic field induction to enable communication between the devices. How does Instream Water use NFC? NFC tags (or chips) can store information and are embedded into our smart bottles and bands. The tags store your account balance and dispensing preferences once these values are transferred to the tag using your smart phone, peripheral NFC writer, or any Instream Water refill station. Is my Instream smart bottle dishwasher safe? Can I have more than one smart bottle or band on my account? Yes. You can have up to 5 bottles or bands associated with your account. Once you exceed that number of bottles/bands, you will be eligible for a hosted account. What is the difference between the smart bottle and the smart band? Both the Instream smart bottle and smart band have embedded NFC tags that can store account balances and dispensing preferences. We understand that many customers have a favorite water bottle that they would prefer to use, so we created the band that can be placed around their bottle and get the same Effortless Transaction Feature as the Instream smart bottle. The Effortless Transaction Feature (ETF) provides consumers with the simplest, most convenient way to pay for the water they consume. By storing your account balance and dispensing preferences directly on your smart bottle or band, you can fill up to 20 ounces of water and process the transaction in less than seven seconds. Why is there a price variable? What forms of payment are accepted at the refill stations? Where is the best place to install my smart band? At the BOTTOM of your reusable water bottle. The NFC reader is embedded in the base of the dispensing platform and only has a 4" range to read the value on your NFC tag. If you place your smart band higher up on your bottle, it will be out of the "read range".